Based on Lee Child’s gun-ho creation, rumoured Mission: Impossible 5 director Christopher McQuarrie presents solid actioner Jack Reacher (2012), starring Tom Cruise in the title role and now available on DVD and Blu-ray. A solitary wanderer after tours of Iraq and Afghanistan, ex-military cop Reacher (Cruise) is drawn into a conspiracy after sniper James Barr (Joseph Sikora) murders a group of people in Pittsburgh. 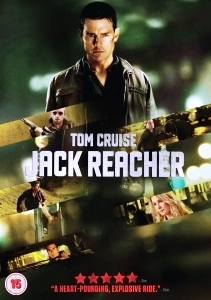 Barr pleads innocence and passes his attorney Helen (Rosamund Pike) a mysterious note, stating “Find Jack Reacher.” Serendipitously, Reacher appears and embarks on the case with Helen in tow. Whilst many where initially shocked at Cruise taking the title role of Reacher (who, in the books is a muscle bound 6′ 5″, 250-pound Arnie-like action hero), there couldn’t be anyone more suited to the role. Cruise delivers his lines with style and sass, providing plenty of chuckles, puffing up his chest as he flirts with Pike’s Helen and wittily quips at the tirade of bad guys before beating them to a pulp. Throughout, there’s a level of light humour that used to pepper many classic action films of the 1980s and 90s, including the likes of the original Mission Impossible (1996). Thankfully for all involved, Jack Reacher doesn’t take itself too seriously and goes back to the basics of being what all action movies should be – entertaining. This is almost epitomised in the casting of Bavarian filmmaker Werner Herzog as antagonist ‘the Zec’, a shadowy figure who rolls out chilling, Teutonic-toned one-liners about nibbling off fingers. After the initial shock of the German director playing what is essentially a classic Bond villain, you realise that Herzog has been excellently cast – with his Germanic lilt adding a further sense of foreboding. We also have an all too brief appearance from Richard Jenkins as Helen’s domineering father, inserting the mildest hint of family drama to proceedings. Pike’s Helen is the typical love interest disappointingly lumbered with an unimaginative ‘t ‘n’ a’ role, the camera voyeuristically focusing on her cleavage throughout. This ogling issue aside, Jack Reacher thrills on several levels. Even the occasional plot hole goes unnoticed, thanks in no small part to the film’s ever-so-faintly-ridiculous plot (saved from being laughable by its rapid pace), that never tires for a moment. We should undoubtedly see a sequel on the way and the possibility of a new Cruise action franchise – which, in this case, may be no bad thing.